The Beurs van Hendrick de Keyser as seen from the Rokin, shortly after its opening in 1611. The Beurs van Hendrick de Keyser was modeled after the building of the London Exchange, dating from 1567. 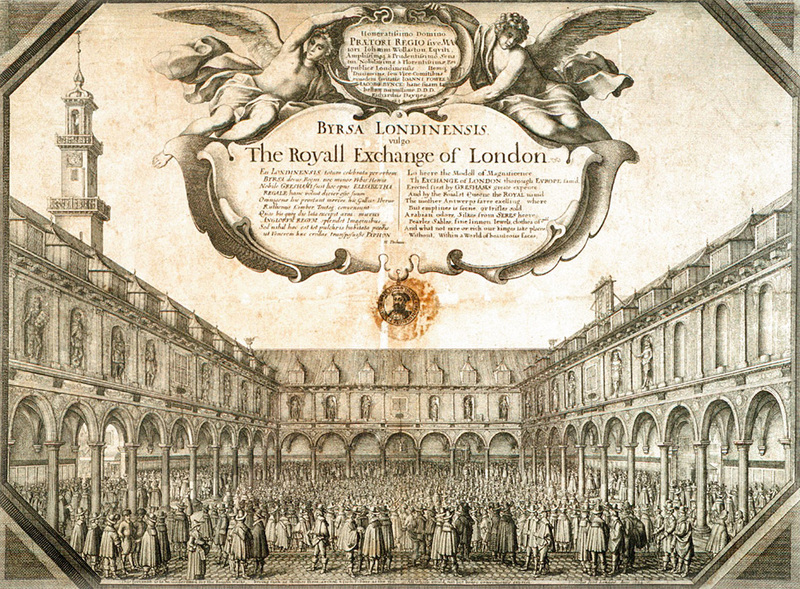 Initially, this building was only a commodity exchange, until share trading also emerged in London in emulation of Amsterdam in the mid-17th century. The Beurs van Hendrick de Keyser after its 1668 renovation; the tower is placed in the center now. Floor plan of the Beurs van Hendrick de Keyser, indicating the locations of the various branches of trade. After the 1668 expansion, securities trading was conducted at the Rokin side of the building (bottom of the image). The Beurs van Hendrick de Keyser, which became an icon of the Golden Age, was completed in 1611. It was situated on the Rokin, south of the Dam Square. The building was approximately sixty meters long and over 35 meters wide. Forty-two numbered columns surrounded the center square without a roof that served as a trading floor. Merchants who had a permanent place were, therefore, easy to find. The long-standing custom to concentrate certain types of trade in corners (‘hoeken’) originates here. Up until the end of the 20th century, the corner man (‘hoekman’or specialist) was a familiar figure on the trading floor. At the exchange, goods were traded primarily. The importance and scope of securities trading, however, increased rapidly. 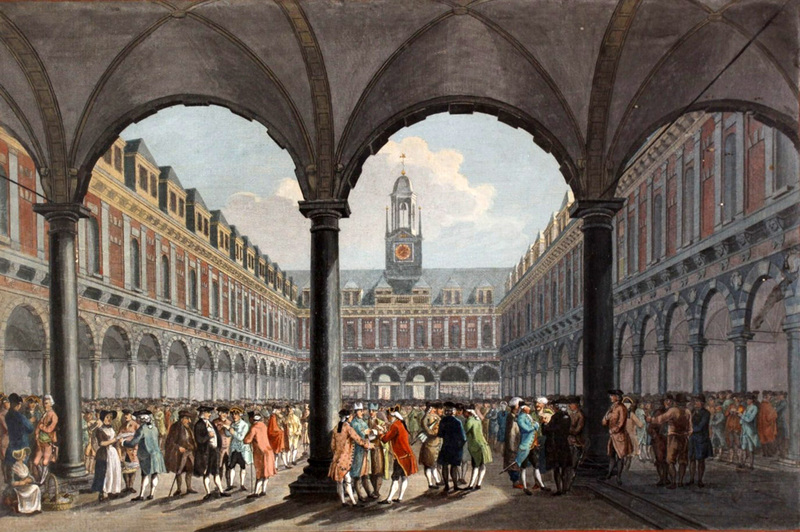 In 1668, its growth even led to an expansion of the trading floor, which was specifically meant for share trading. The exchange existed for well over 200 years, and during that time, it grew into a foundation for the development of Amsterdam and the contemporary Netherlands. Subsidence necessitated closing of the building and eventually led to its demolition. 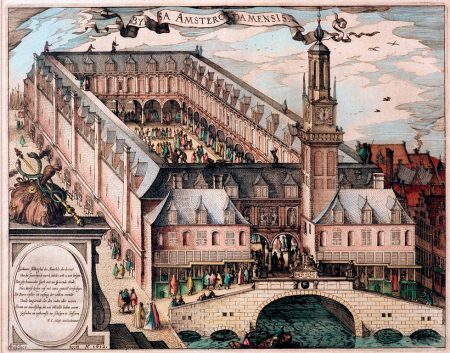 After traders had been forced to rough it with a temporary shelter on the Dam Square for ten years, Amsterdam got its second Koopmansbeurs (Merchants Exchange) in 1845: the Beurs van Zocher.